Client: Manufacturer of electrical insulating varnishes and resins. Requirement: To load production materials from ground level up onto 11 metres high floor. Cantilever runway beam projecting from floor landing area out over stairwell fitted with 2000 kg capacity Zone 2 pneumatically powered travelling hoist with push button control pendant mounted on a remote track. Custom lifting cage with fork truck facilitating base, Full height mesh sides and swing opening door with locking latch. Existing handrail replaced with specifically designed mechanical swing out gates system with self-locking safety latch system. Providing full edge protection for all personnel, throughout loading operation. 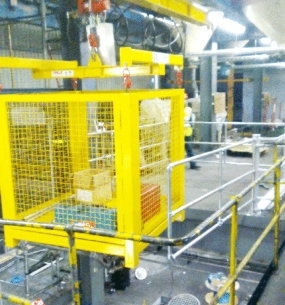 Design, manufacture, installation, and testing of two complete systems provided by Dales’ in-house crane and Mezzbarriers divisions.